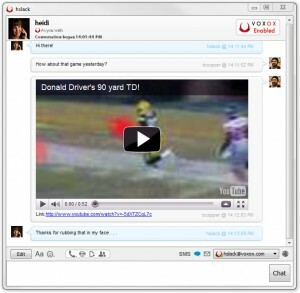 Over the years, technology continues to enhance all aspects of the game of football. It’s helped athletes avoid injuries and shatter performance records, improved in-game communication between players and coaches, and revolutionized the way viewers at home experience the action. Now, it’s time to look at what happens when we inject a syringe of Voxox technology into the art of fan-to-fan taunting, to give a boost your trash-talking game. Your team has the ball and TOUCHDOWN! It’s time to update your status. But you don’t want to miss a second of the game—or any of the crazy Super Bowl commercials. Not to mention, timing is everything. So, fire up Voxox and broadcast a global heckle across all your networks at once. Just type your taunt in the status bar at the top of the application and with one click you’ll update your global status across Twitter, Facebook, AIM, whatever networks you’re connected to. It’ll save you time and headaches and get your message out fast. When your team wins, you can give your chat buddies the post-game pile on. Did you know if you paste a YouTube URL of game highlights into a chat, the video will play right inside the window? If your buddy retreats from his desk, you can send a text to his cell phone right in that same chat window. He can run but he can’t hide, and you’ve got all your communications in one unified window. Imagine you have to pause the game for a chili-related emergency. Now you’re watching a few minutes behind and the phone rings. With Voxox, you can send that call to voicemail but still listen in. It’s a feature called Eavesdrop—if the call is urgent you can pick up and join. But if it’s starting to sound like it may contain game spoilers, drop the phone and finish listening later. Now let’s say you end up on the losing side of the game. As the clock hits zero, your phone rings—it’s the other team’s #1 fan is ready to give you an earful. Backup. You’ve already downloaded Voxox, which means once the game started going south, you went to my.voxox.com and set it to block all calls from that person’s number. It’s called Dead End—you can play a busy signal, disconnected message, or your own custom recording specifically for that person. A brilliant defense! With Voxox on your side you are guaranteed to have a great game. Like the players themselves, you’ve got technology helping to improve your performance and avoid injury. You’ve got nothing to fear, so get out there and speak free with Voxox! Still haven’t tried the new Voxox? Go Get It!